Mana, that famous, ever-so popular magical source, drives the flashy spells we so often cast. It is an indispensable mainstay of RPG's. The World of Mana revolves around it. Within that world there are Trees of Mana, Secrets of Mana, Children, Goddesses, Swords, Heroes, Trucks, well, maybe not Trucks, but there is a wide assortment of mana-laden objects within the World of Mana. Children of Mana reintroduces players to that world, and it's bounty of mana sources. The game is the second release in a two-week RPG gift to DS owners this fall, the first being Magical Starsign. While Magical Starsign is a more traditional role-playing excursion, Children of Mana is actually an action RPG, and a dungeon crawler to boot. Players take the role of one of four possible playable characters within the game. Flick, (or Ferrick, no real confirmation on that one) the aspiring warrior who does battle with the sword; Tumble, the young female archer with a strong sense of justice; Poppen, the even younger boy who fights with a flail and strong magic; and Wanderer, one of the cat-people tribe known as the Nikita, who fights with a hammer. Each of the weapons plays a different role in what is Children of Mana's most unique feature. The game's battle mechanics revolve around a system of reaction. Attacking an enemy results in that enemy bouncing backwards from the damage, and subsequently damaging other adjacent enemies, objects, or even players. The repercussions cause a rubber-band elastic chaos to fill the entire battlefield. The weapons of battle also offer some variety in each performing a specific side function, and equipping two of the games four varieties of weapons at any one time is an option. The sword, in particular, offers a shield for players to bounce ranged attacks off of, while the flail, a mid-range weapon, can be extended as a grappling hook. Players will face their battles throughout the games many dungeons. Children of Mana is, in fact, a dungeon crawler. Players are tasked with traversing dungeons, which while they aren't randomly generated, do feature random exits and object placement. In order to exit the dungeons players will have to often defeat a boss, or discover the Mana Eggs located within. Some bosses seen from the games early footage look truly impressive in size and detail. A three-headed beast that towers of the player, or a flaming phoenix that swoops in to make attacks are just some of the foes included in the game. Players who need help defeating the bosses of the game, or any regular enemy for that matter, can call upon a magical summon creature to aid them. The summons take the form of the eight elementals who have been staples of the franchise. Players have the opportunity to equip one elemental at a time, outside of battle, and each summon has the ability to benefit the player in one of two possible ways. Running into the summon after it is called will result in one of a multitude of possible benefits, or letting it be for a few seconds will result in an elementally specific explosion for "massive damage." 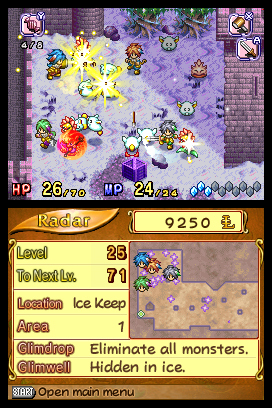 The game also allows players to initiate more damage than normal by using a special tactic in which they perform a flurry of fast-paced attacks. The berserk action is gauged by a meter that fills as player's battle enemies, and depletes as it is used. This fury mode also introduces one more special technique for the games many weapons. Yet another feature of the game is a local wireless mode where up to four players can enjoy explore dungeons cooperatively, or against each other. Each selecting one of the four characters, they have the opportunity to multiply the chaos that the rebound battles deliver. 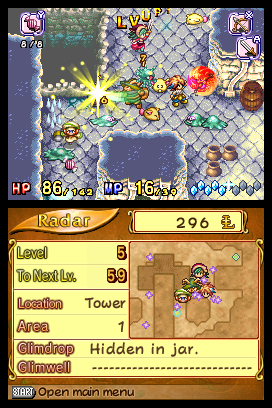 The story of Children of Mana will unfold throughout the gameplay, as well as in many anime cutscenes, both of which look visually striking and impressive. The Mana franchise has drawn many people because of its story and persistent world; hopefully this title will continue those offerings. Children of Mana doesn't look like it's having any difficulty in doing that so far, and the absolutely robust list of gameplay features is a good start. It's hard to imagine that fans of the genre will be let down by this release, but it is all up to how well the many ideas within Children of Mana are implemented. I'm hoping they're as good as they seem, because in my eyes, Children of Mana is already giving Magical Starsign and Final Fantasy III a solid run for their money, or at least a run for my appreciation.